As the Golden State Warriors sat in their locker room a year ago, digesting the final loss of the worst collapse in NBA history, Andre Iguodala stood and said he wanted to address the group. Iguodala rarely does this, according to several members of the team. Everyone stopped. Iguodala insisted they would recover. He mentioned that the San Antonio Spurs had never repeated as champions, a tidbit Warriors coach Steve Kerr, himself a former Spurs player, had mentioned often to underline the difficulty of last season's challenge. If the team responded the right way, Iguodala said, they could put themselves in position to chase several titles -- and wash away the sting from this loss. Some in the room thought Iguodala might have been hinting at the potential signing of Kevin Durant, though Iguodala never uttered his name or directly discussed free agency, sources said. They glanced at Harrison Barnes and Andrew Bogut, two players who would almost certainly be elsewhere if Durant joined. Durant joined the team, of course, and the Warriors are champions again after vaporizing the competition over an unprecedented 16-1 rampage through the playoffs, capping the NBA Finals with a 129-120 win over the defending champion Cleveland Cavaliers on Monday to take back the crown in five games. In the end, they are exactly the team the league expected and feared: the best offensive team ever, and the league's stingiest defense over the regular season and postseason combined. Aside from an embarrassing season-opening loss to the Spurs, there was almost no drama -- no angst over touches, no tense players-only meeting, no slow start. They gelled fast, and blitzed everyone. "I don't feel like I sacrificed at all," Klay Thompson told ESPN.com last week. "I'd rather be a part of something that could leave a legacy. There is more to basketball than getting yours, or being the guy. I hope I do this for a long time for the Warriors." The Warriors were never worried about integrating Durant on the court. "This was not getting an isolation guy who needs the ball in his hands," Kerr told ESPN.com in Cleveland. "He loves moving without the ball. He loves passing. He loves running the floor. He fit in to our system perfectly. We lost some key guys to get him, but you are talking about the second-best player in the world. You don't even think about it. You think, basically, it's a miracle: 'Holy s---, we are getting KD to this team.'" Team officials like to say that in a way, adding Durant was easier in basketball terms than mixing in LeBron James would have been. They fretted a bit about how Durant would transition into their culture, and how he would get along with Curry. They did not know each other well. At a team dinner after their fourth preseason game, in Denver, Durant and Curry ended up at the same table. Players and coaches gradually filtered out, but the two stars sipped wine long into the night. Team officials watched, happy the two were getting past the awkward early stages of any friendship. "We just talked about life," Durant told ESPN.com. "When you get a good bond with someone, you can talk for hours." Five days later at a dinner in Las Vegas, after an exhibition game there, Durant approached Bruce Fraser, an assistant coach, and revealed why he came to Golden State, they both recalled. He didn't need a championship, Durant told Fraser, though of course he hoped to win one. He wanted a new experience, and from afar in Oklahoma City, the Warriors' culture looked appealing. After a month, Durant was ready to offer an early conclusion: "It's even better than I thought," he told Fraser. "I came here to have fun," Durant told ESPN.com before Game 4. "I wanted to be one of the guys. Right away, they didn't treat me like I was 'KD,' or act like they wanted me to be a kind of vocal leader. I was happy from Day 1." Even if the basketball fit were to prove more troublesome than expected, Durant was obviously worth it. "We all felt we needed some fresh blood anyway," Kerr said. "Getting to the Finals a third year in a row is so difficult emotionally." The basketball fit was not troublesome. The coaches added more new plays for David West than for Durant, Kerr said. They only had to break Durant from some of the habits he learned in Oklahoma City's more stagnant system. On fast breaks, Durant would run to the corner and stand there. The Warriors taught him to keep moving if he didn't get the ball right away, slash inside, and set screens for Curry or Thompson. Fraser ran him through basic give-and-go drills. After offensive rebounds, Durant learned to slam Curry and Thompson's defenders with picks instead of floating out to the 3-point arc. "I was used to waiting around for the ball to come to me," Durant said. By the end of training camp, he had those things down. "It was pretty seamless," Thompson said. "Those were basically the only two times we had anything to talk about as a team," Kerr said. Kerr recalibrated the offense to feature more pick-and-rolls for Curry. The team's passes per game ticked up in mid-January after falling into a rut in the prior six weeks. "What makes our team dynamic is Steph using high screens," Kerr said. "We should have been doing more of that around Christmas. We basically told Steph, 'Just be you again. KD is going to get 25 no matter what.'" The NBA has had super-teams before, but none quite like this. The Warriors boast four All-NBA-level players age 29 or younger. Three of them rank among the 10 greatest shooters ever; they are all lethal away from the ball. The fourth, Green, is more initiator than finisher, and ranks as a generational defensive player. The only-one-ball problem that caused growing pains with the Miami Heat was never going to be an issue in Golden State. They are a fully realized powerhouse in Year 1, and they are confident they will get even better as Durant absorbs the tendencies and quirks of his teammates -- and they absorb his. "We only peeled the first layer," Fraser said. "There are many more." The league and union must grapple with how we arrived here. A salary cap is designed to prevent star-laden teams from adding more talent without giving up much in return. The league's rich new national TV deal broke the system. It triggered a one-time-only mega-spike in the cap -- from $70 million last season to $94 million in this one -- that provided Golden State room to sign Durant and retain most of its key players. The league saw it coming late, and in 2014 proposed a method of phasing in the cap increase in increments over more years. The players would still get all their money. It would be just be distributed a little differently. The union rejected the idea out of hand, and didn't counter by asking for anything in return -- beyond making a little noise, sources say, about the possibility of getting some of the TV money in advance. "You know where your competition is," said Danny Ainge, the GM of the Boston Celtics, who chose to stand pat at the trade deadline when the Chicago Bulls demanded a king's ransom for Jimmy Butler. "The formula to become an elite team hasn't changed. What you're asking is if Golden State has changed things so that you have no chance." Most teams don't have the luxury of even asking this question. Franchises in Charlotte and Memphis just have to be as good as they can be every season. The Celtics are different. They are straddling two paths as a 53-win team with a heap of extra draft picks, including the No. 1 pick this month and the Brooklyn Nets' unprotected pick next season. The Toronto Raptors were in a similar situation when they flipped Terrence Ross and three draft picks -- including one first-rounder -- for Serge Ibaka and PJ Tucker. They went close to all-in, though without surrendering any asset nearly as valuable as those Brooklyn picks. Cleveland humiliated them in four games. Most team executives around the league agree there might be some small overall chilling effect on win-now transactions in the wake of Golden State's run. Middling teams without a star could attempt a multi-year process-style bottoming out, though none appear primed to do so. "As a response to the Golden State mega-team, I hear the NBA is considering giving out banners to teams who don't get swept," chuckled Daryl Morey, Houston's GM. Morey is joking. He has a top-five player in James Harden -- "top-three, we think, for sure," Morey said -- and will not sacrifice a season of Harden's prime in trembling awe of these Warriors. Nor will the Spurs trifle with Kawhi Leonard's best years. They will not trade those players to bottom out, either. The whole point of tanking is to get a chance at players who might be as good as Harden and Leonard. Weird stuff happens. Role players make unexpected leaps. Teams nail draft picks. Stars get hurt at the wrong time. Making the Finals would still mean something to any Eastern Conference team that unseats LeBron, even if the Warriors sweep them. "They are not unbeatable," Morey said of Golden State. "There have been bigger upsets in sports history. We are going to keep improving our roster." Ainge remembers feeling his 1986 champion Celtics would stay on top for years. The Detroit Pistons seized the Eastern Conference two years later. 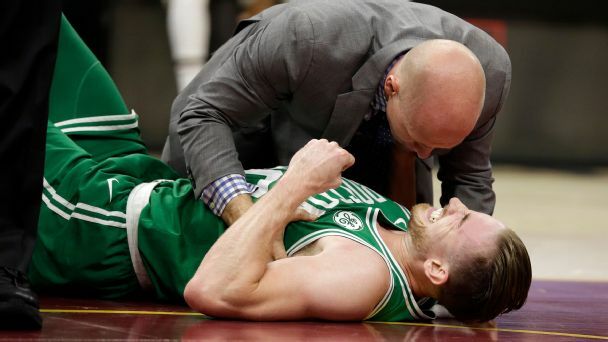 "Something can happen that nobody foresees," Ainge said. "I don't look at it as doom and gloom right now." Boston paid Al Horford the max last summer. He is 31. If Durant were still in Oklahoma City, Boston might burn more future assets to win today. But they are still going to try. "We are definitely not in punt mode," Ainge said. "But trading away picks and promising young players for a veteran who might be 5 percent better is not in our plans, either." There is always a super-team to chase. If this one is better than its predecessors, that doesn't mean everyone peels off that chase. "I like having targets in Cleveland and Golden State," Ainge said. "I like trying to meet their standards. It might not happen in a year. It might not happen in five years. WIth them, it might never happen. That's how special they are." The next tier of teams might have to take more risks to increase their game-to-game variability -- and nudge their ceiling up, Morey said. Houston traded a first-round pick for Lou Williams, a streaky scorer who might give an underdog two or three crazy outlier games it needs to pull off an upset. Other rivals will need to hit home runs on those trades, or preserve cap space for long-shot runs at stars in free agency. Miami is loading up now to pursue Gordon Hayward, according to league sources. They also know the Warriors may not be able to afford their team as the four stars sign mammoth new deals, potentially starting with Durant and Curry this summer. Depending on what happens with Iguodala, Shaun Livingston, and Zaza Pachulia -- also free agents in July -- the Warriors could vault $20 million over the tax next season, and $30 million over in 2018-19. Then comes Green, in the summer of 2020. If he hits free agency eligible for the super-max designated player extension, the Warriors are looking at a roster bill approaching $440 million. Coaxing two of the stars into below-market deals wouldn't make enough of a dent. They also paid almost $50 million into the league's revenue-sharing system last season, according to sources familiar with the data. The Warriors print money, and they will print more when they move into a new arena in San Francisco. They are worth at least four or five times what this ownership group paid for them a half-decade ago. An unexpected leap in the cap could ease the pain. Still, no team has ever paid anything like that. The Warriors almost certainly won't. The only way out is to trade one star. Thompson would seem the likeliest candidate. Nobody is ready to go there yet, of course. The Warriors can't even acknowledge the dilemma -- even whisper the chance of a breakup -- before they have signatures from Curry and Durant on long-term deals. They will swallow normal-ish tax bills to hunt rings over the next two years. "That's what we want -- to be contenders for years and years," Thompson said. "So far, so good."